In what form are you now? Did you have some rest after the Zloty Tur or started training immediately? – Now my form is like the rest of the year. I don't have big "ups" and "downs", but after all we will see this at the competition. After Zloty Tur, like after every other competition, I have a rest period of couple of days but I don't take an offseason rest because of the many competitions I am willing to participate at althought it would have been good to have a complete rest period. Will a Supermatch be the first competition for you in the new season? – Yes this will be my first competition for the year. Do you do a special training for an Armfight with an Italian athlete? Or do you think that you can win without intensive training? – I don't train special for somebody, in general I am trying to improve myself and my style. How do you rate your chances? – It is hard to rate anything, even my chances, after all this is armwrestling. I guess we will all see it at the day of the event. What do you think about the other matches of Vendetta? 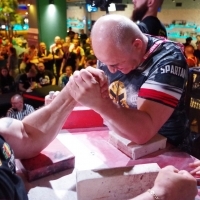 – I am happy to see different nations, competitors and armwrestling styles. It would be very interesting to see all of the Vendettas. I wish good luck to everybody!